WILL YOU MAKE THE CHOICE? the God of my salvation." On Thursday, December 7, I went under the knife for a total hip replacement. Although I felt I was too young to have this much arthritis in my hip, the x-rays did not lie... nor did the pain. As I quietly dreaded this major surgery (anytime the bone saw is utilized, it is a major surgery! ), I was determined to be a blessing to every doctor, nurse, orderly, and physical therapist. Regardless of the pain or discomfort, I was going to choose to rejoice, give thanks, and trust God to make something good from something totally unwanted. As of this writing, I am one week post-op. I am progressing nicely, and should be off the morphine drip any day now (just kidding). Many people have been praying for me to have a full and speedy recovery... and God has been gracious to answer those prayers. As I reflect on things in my life right now, my current trial is my right hip. However, next month it will undoubtedly be something else. Life is just that way. All of us are either entering a trial, in the midst of a trial, or just coming through a trial. Trials are part of the human experience. They are inescapable and unavoidable. Jesus said that we would have trials and tribulations in this world (John 16:33). But in every challenge we face, the Lord says, "My child, trust Me and rejoice." Habakkuk 3:17 paints a bleak and dismal financial picture for any agrarian society. The crops failed miserably. The flocks and herds are gone, and food is scarce. What is left to do? Get bitter, cynical, sour, and fatalistic? Throw in the towel on life? Curse God and die? NO! The right response when the bottom drops out is to "exult in the Lord" and "rejoice in the God of my salvation!" Did you notice that Habakkuk said, "I will..." in verse 18? Rejoicing is not an issue of the emotions, it is an issue of the will. I don't have to feel joyful to rejoice. I don't have to feel thankful to give thanks. The successful Christian life is not led by your feelings, it is led by your faith. When you and I choose to praise the Lord regardless of the circumstances, God is glorified and people notice. The greatest witnesses for Jesus Christ are not those who are rejoicing in the Lord while on the mountain top. They are those who are rejoicing in the Lord while facing the valley of the shadow of death. Nothing gets an unbeliever's attention faster than a grateful, praising Christian still trusting Jesus even though plagued with the worst of trials. While circumstances change frequently, God never does. Our focus must always be HIM! Come what may, you and I can rejoice in Him... in His unfailing love, His wonderful presence, and His constant faithfulness. No trial or tribulation can alter who He is to us. I don't know what difficulties you are facing today. No doubt, many are facing trials far worse than I have ever faced. Whether your trials are mild or severe, the question is always the same: Will you choose to rejoice in Jesus, the One who is over every test and trial? Will you look to Him and trust Him, no matter what? One of my favorite verses is found in Revelation 2:10 where Jesus said, "Be faithful until death, and I will give you the crown of life." To be sure, life does not always turn out the way we want it to. All of us face detours, dead-ends, and dry holes on the road to heaven. There are many things we face in life that we cannot control. But, we do control our response to circumstances. We can make the choice to be faithful, grateful, and thankful, until the day we die. P.S. I would love to hear your thoughts on this. Direct questions and comments to pastorjeff@fromhisheart.org. Dr. Jeff Schreve believes that no matter how badly you may have messed up in life, God still loves you and has a wonderful plan just for you. From His Heart provides real truth, love and hope on over 700 radio stations each day, in 182 countries each week on TV, and is always available online. Pastor Jeff takes no income from this ministry. All donations go to furthering the broadcast outreach. As a listener/viewer supported ministry, we thank you for joining with us to help speak the truth in love to a lost and hurting world. Go to www.fromhisheart.org for more information. God has placed some exciting opportunities before us to impact more lives for Jesus in the year ahead. But it will take us reaching our $400,000 goal this month to make it happen! 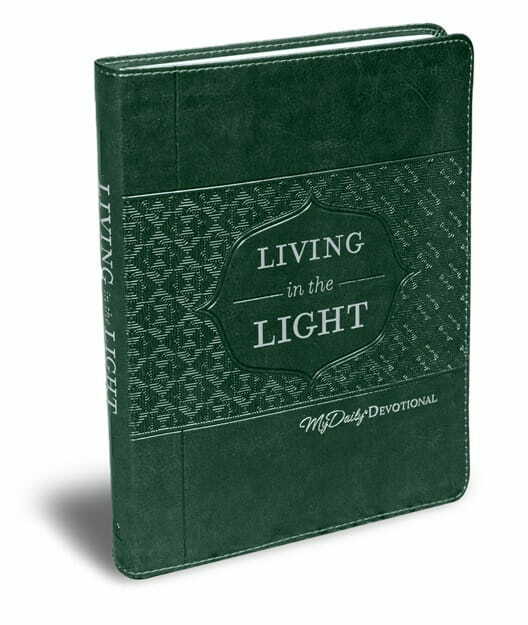 As a thank you for your gift of $25 or more today, you get a new yearlong daily devotional book Pastor Jeff helped to write, called Living in the Light. Together we can deepen our Gospel impact in the year ahead.